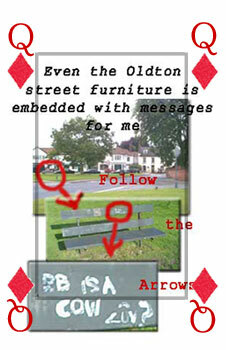 Once I started looking for evidence of Oldton's existence, it seemed it was everywhere. Every email conversation I had, every digital photo I took had something in it that I could link to my search. It was as if I had found a new cipher by which I could decode the whole world. And what a relief to be able to say explicitly that the shadow of my father was colouring every day of my life. This had always been so. But now it seemed safe and not embarrassing to say it. Simply by searching fror Oldton I had in part already found a way to cope with my past. Now the challenge was not to lose too much of myself in my disappeared town. Some things do need to stay in the present.